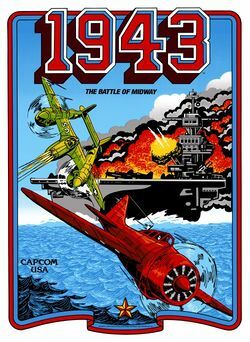 1943: The Battle of Midway (1943: Midway Kaisen in Japan) is a vertical scrolling shooter arcade game released by Capcom in June 1987. Capcom released their own port for the NES, but the game has also been ported to the Atari ST, the ZX Spectrum, the Amstrad CPC, the Commodore 64 and the Amiga. In 2005 it was re–released for Xbox and PlayStation 2 as part of Capcom Classics Collection. The overall faithfulness and quality of execution of these third party versions varies greatly. 1943 is the second game in the 1940s series, following the successful 1942. Arcade cabinet for the game. Xbox Capcom Classics Collection cover. PlayStation 2 Capcom Classics Collection cover. This page was last edited on 13 June 2013, at 03:26.